As you can tell from my post yesterday, I'm ready and eager to celebrate my husband's birthday this weekend! We're not big party types of people but maybe one of these days we'll throw a big bash! In the meantime, we're happy his day falls on a weekend so he gets two days to celebrate. This week, I've been attracted to outfits that are easy to wear. This skirt has been a favorite of mine on this blog and I love how easy it is to pair with other pieces. Simply wearing a grey t-shirt like I did still makes me feel chic. Of course, the panama hat helps, too. This look is adorable! I am sure you guys will have a great time with your husband's birthday festivities! Yay!! 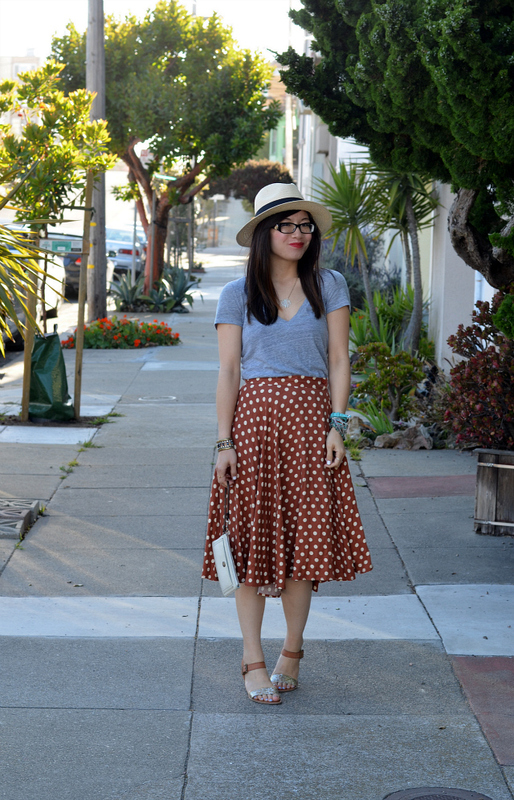 This is the perfect weekend look, LOVE this skirt, and you look adorable in that hat. I love every part of this outfit...so pretty! Hope you two have a lovely weekend and a happy birthday to your hubby! I love your skirt! Love LOVE how cozy and sweet you look! Absolutely in love with that skirt! Cute look! Love the vintage inspired skirt. This is adorable and looks totally comfortable. Love it! polka dots! !i'm crazy about polka dots,i even plan to get a polka dots sport bra the other days.my man agreed to buy for me but i ended up not buying it..i need to save for my taiwan trip. happy birthday to him! you guys have a fabulous weekend! love your hat, skirt and sandals nancy. they're too cute. Have fun celebrating your hubby's birthday weekend. You are eternal chic - no matter what you are wearing. You look fab as always! Maybe you like my Blog too and want to follow me? I love the skirt and I LOVE those shoes - they are the perfect amount of pizzazz for summer! This post is so perfectly titled! You look adorable and so ready for the weekend. Love it. Cute outfit! Love your sandals and hat so much! Have a great weekend! I love it! It's easy and comfortable, but cute. Hope you and your husband had a great weekend! 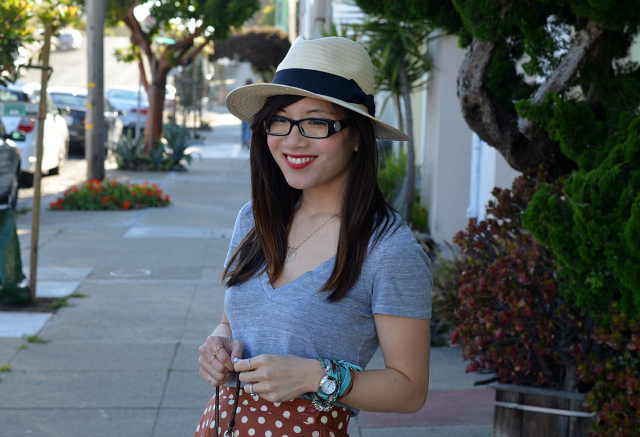 Such a cute hat–I love this look! Love how casual but polished this is! I am needed that hat, stat! You look so adorable and breezy! This is such a cute outfit! 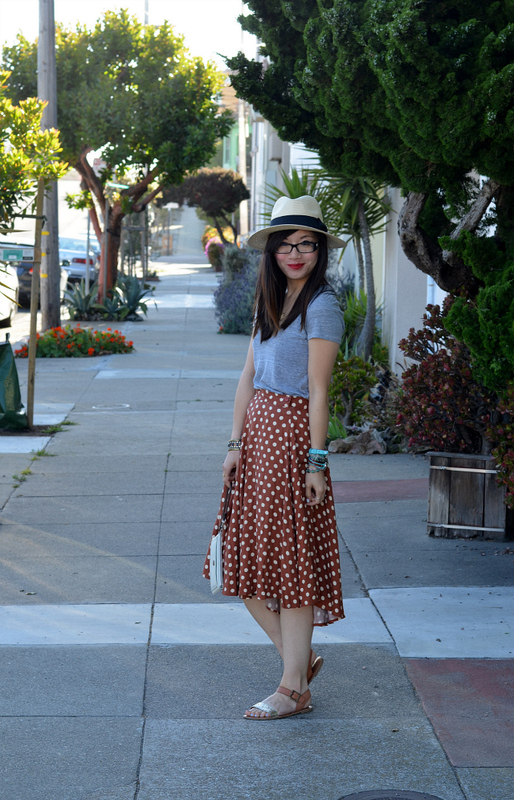 I love the polkadots- whimsical for summer! 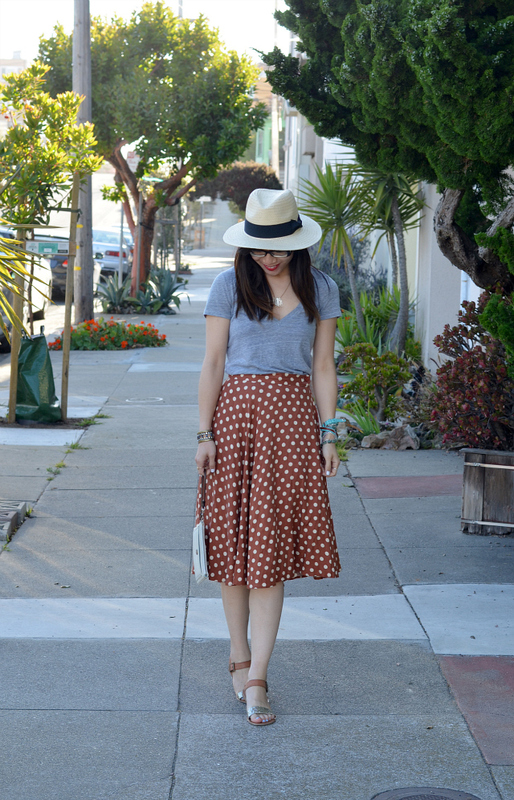 Such a cute casual outfit :) I love the polka dot skirt, and the panama hat is such a great touch! !